I want my life to make a difference in all that I do as both the nurse and nurse educator. 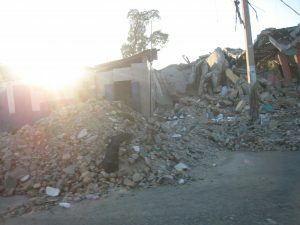 I was motivated to get out of my comfort zone and volunteer by serving in Haiti with a medical mission team through our local church shortly after the big earthquake in 2010 that devastated much of this impoverished nation. I was overwhelmed by the physical devastation and pressing physical, emotional, and spiritual needs as we cared for those living in tent cities whose homes had been destroyed. I wondered if our team was making a difference with the small number of people we were able to minister and serve. But I left Haiti with peace knowing that our team did the best we could under difficult circumstances. We served well recognizing that every person we cared for has intrinsic value and worth. This is the heartbeat of nursing wherever care is provided. Nursing is serving others with a heart filled with a love for humanity that recognizes the inherent value and worth of each person you care for, and that this person matters to you (Benner & Wrubel, 1989). Caring for others has eternal significance. This is the spirit that Mother Teresa recognized as she served and cared for the poor in Calcutta, India. To make a difference as a nurse, you do not need to go to another country to serve in medical missions but can do so right where you are by serving as a nurse with the right spirit. The founder of the modern era of nursing provides an example of what this looks like in practice. 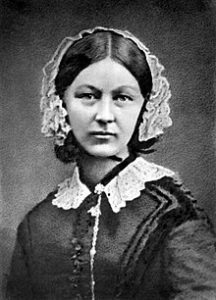 Florence Nightingale was motivated to transform health care and the nursing profession because of her faith and belief in God(3). At the age of 17, Nightingale felt that God had spoken to her and was calling her to service. She viewed nursing as a search for truth and used God’s laws of healing in nursing practice (4). She willingly chose to sacrificially serve during the Crimean War caring for the wounded, making rounds as the “lady with the lamp,” and educating nurses. She implemented numerous reforms to lower the 73 percent mortality rate from diseases alone and had a 1,000-page report of statistics she compiled during the war. Nightingale established her schools of nursing after the war based on her “evidence-based practice” that validated the importance of hygiene and the environment to promote health (5). Nightingale’s life clearly demonstrates that faith, service, and nursing can and do complement one another in practice! If you have a passion for caring for others with this spirit and would liking to minister and care for others in other parts of the world, this is what I have learned to help you take that next step. If you are a student who has textbooks you know you will never open after graduation, or are an educator who has older editions of textbooks gathering dust that are less than ten years old, they can be put to good use in Liberia, an English-speaking African country whose nursing programs do not have enough textbooks for each student. It is not uncommon to have an entire nursing class of 80 students with just a few textbooks that are shared by all. This ministry sends a shipping crate at least twice a year to Liberia that includes medical supplies as well as all textbooks that are received to this address. They are a 501(3)(c) nonprofit and can provide a tax-deductible receipt for your donation upon request. 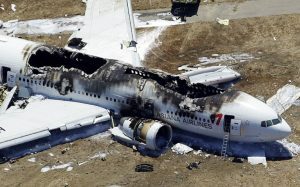 To put the needs of the developing world in context, if 100 jetliners crashed today, killing 26,500 people, it would get my, your, and the world’s attention. But a tragedy of this scope occurs every day in the developing world: 26,500 children die of preventable causes related to their poverty every day. Over one year this equates to 10,000,000 lives lost every year. If you would like to be aware of opportunities to serve in the developing world, please explore the resources that I have compiled in the links below. One book that continually challenges me is Don’t Waste Your Life (free download eBook link) by John Piper. Each one of us has a finite amount of time to live our life regardless of what we do. The greatest tragedy in our life would be to come to the end of our days realizing that we wasted the one life we have been given on this earth by living primarily for ourselves. A life lived to serve others is a life that is NOT wasted. When you bring this perspective and spirit into all you do as you care for others, this is what makes nursing so much more than a job or even a profession. I collaborated with experienced physicians who have served in the developing world and compiled a list of appx. 40 medications and supplies that are essential for meeting the vast majority of medical needs you will experience in a community clinic in the developing world. The types of illnesses best treated are also incorporated in this list and are an essential formulary to take with you on any medical mission trip! The Clinic Record Documentation form provides needed documentation for each patient seen as well as all medications on the formulary on the back side for easy selection. I have found Blessings International to be a reliable, economical source of bulk medications. They also have medication baggies and icon driven med labels that do not require the ability to read to understand. As Christians, we must recognize that in this world we are in the enemy-occupied territory and that our battle is not against flesh and blood (Ephesians 6: 10-20). All of our efforts to minister effectively must be grounded in persistent prayer and intercession. Operation World is a classic book that gives you essential demographic data on every nation in the world and topics of prayer for that country that will help you be more effective in your service. Operation World: The Definitive Prayer Guide to Every Nation is the definitive global prayer handbook that will help focus your heart and life towards God’s passion for His glory. With over 1 million copies of past versions sold, the all-new 7th edition has been completely updated and revised by Jason Mandryk and covers the entire populated world. Whether you are an intercessor praying behind the scenes for world change, a missionary reaping the benefits of intercession or merely curious about the world, Operation World will give you the information necessary to be a vital part in fulfilling God’s passion for the nations. The Way to God: Written for children but suitable for adults as well. Its purpose is to share God’s love and plan of salvation and how to live for Jesus. Features illustrations and larger type size. Who Am I That a King Would Die in My Place? Shows who we were made to be, what we became, where that leads us, our need for God’s rescue, and what we can become by accepting God’s grace. How to Know God: Tells how to have a personal relationship with God. Designed for Muslims, but excellent as a general evangelistic tool. The Power of God: Shows God’s creative, saving, sustaining, and overcoming power. For believers and non-believers. For those that want more information on Haiti and how to serve and minister effectively, the following links are a starting point on this adventure! Blessings International: This ministry is essential if you want to purchase medications in bulk (usually #500-1000) per medication. They are reasonable in price and they also have medical supplies and the visual icon med labels that are essential for clinic ministry. 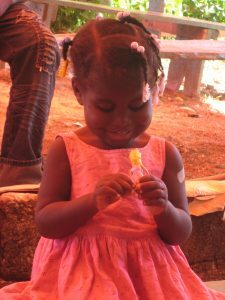 Haiti Nursing Foundation: This organization supports the advancement of nursing in Haiti. Through a governing board comprised of both Haitian and Americans, and support from the Presbyterian Church USA, the only private baccalaureate nursing school in Haiti (Faculty of Nursing Science of the Episcopal University of Haiti or FSIL). You can help provide financial support for a nursing student, or an educator who serves for 1-2 weeks or longer as a guest nursing faculty. Partners in Health: Is an international health organization relentlessly committed to improving the health of the poor and marginalized. They work in 12 countries including Haiti. Founded by Paul Farmer who has written an excellent book, Haiti After the Earthquake. It’s a compelling eyewitness account and gives a “big picture” perspective on Haiti. 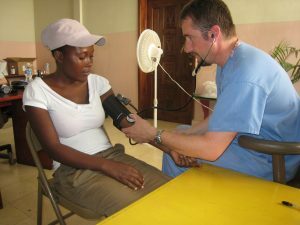 Healthcare Challenges in Haiti is also an excellent article that will give you a greater understanding of Haiti’s ongoing challenges to deliver needed medical care with links to healthcare indicators in Haiti. Project Medishare: Operated by the University of Miami Medical School since 1994, one of their priorities is operating the only trauma hospital in Port Au Prince. There are opportunities to serve as a physician or nurse in this facility that also is staffed by Haitian healthcare professionals. Medical Teams International: Their mission is to demonstrate the love of Christ to people affected by disaster, conflict, and poverty around the world. If you are a healthcare professional who desires to serve with an emphasis on demonstrating the love of Christ, this is a great place to start! Community Health Evangelism: is a true best practices model for integrating evangelism and discipleship with community-based development. CHE is used around the world by churches, mission agencies, and non-government organizations to lift whole communities out of cycles of poverty and disease. When Helping Hurts, reveals the faulty assumptions you may have about the causes of poverty, which results in the use of strategies instead of helping, do considerable harm to poor people and themselves. Foreign to Familiar-A Guide to Understanding Hot and Cold Climate Countries seeks to aid the reader in cross-cultural communication and relationships by highlighting the differences between hot (relationship-oriented)- and cold (task-oriented, American)-climate cultures. The Hole in Our Gospel, written by the current president of World Vision, challenges Christians to reflect Christ’s love to our neighbors at home and globally and to embrace the whole Gospel of Jesus Christ by caring and embracing the neediest and most vulnerable among us. Pastor John Piper of Bethlehem Baptist in Minneapolis, Minnesota, has written: Let the Nations Be Glad: The Supremacy of God in Missions. Pastor John states, “Missions is not the ultimate goal of the church. Worship is. Missions exist because worship doesn’t.” Piper draws on key biblical texts to demonstrate that worship is the ultimate goal of the church and that proper worship fuels missionary outreach. I have found the following to be excellent resources for any student or nurse. Nurses Christian Fellowship can be established as a student chapter at any nursing program. I encourage you to establish a chapter to support other like minded students and be a living light where God has placed you! 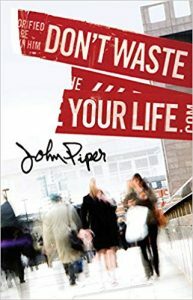 Book: Don’t Waste Your Life by John Piper/FREE pdf! 2. Hampton Robb, E. (1900). Nursing ethics. Cleveland, OH: E.C. Koeckert. 3. McDonald, L. (1999). Nightingale’s spirituality: The faith of Florence nightingale. uoguelph.ca. Retrieved June 15, 2013 from http://www.uoguelph.ca/~cwfn/spirituality/spirituality.html. 4. Macrae, J. (1995). Nightingale’s spiritual philosophy and its significance for modern nursing, Image Journal of Nursing Scholarship, 27(8).